We get a lot of customers asking questions about why they need to treat their decking and if they need to treat it at all so I thought I’d try to answer some of the more common questions for you here. I’ve also tried to give solutions to some of the common problems caused by high street products peeling and flaking. If you have any more specific questions then feel free to leave a comment below or get in touch with us via email. My deck is hardwood, do I need to treat it? The simple answer is yes you definitely do! Whilst hardwood is denser in structure than softwood, it can still take on water and will be subject to movement when exposed to the elements which can lead to cracks and warping. Protecting the wood with a saturating wood treatment will prevent this – whether it’s hardwood or softwood. What is the best finish for my deck? 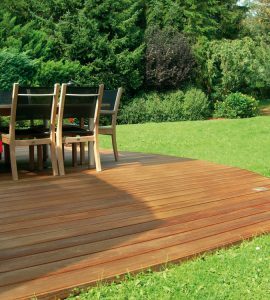 The most effective way to protect your deck is to use a product which does not form a film on the surface of the wood. Most high street products create a thin layer on the surface of the wood which over time (not much time in heavy traffic areas like decks!) begin to rub away leading to peeling and flaking and the wood lo longer being protected. These products then also need to be removed before reapplying which it time-consuming and laborious. More effective products are those which penetrate the wood and saturate it – this means they are protecting the wood from within and therefore can not peel or flake. Owatrol’s Textrol is a saturating wood oil whilst Aquadecks is a water-based penetrative wood finish, both of which have easy ongoing maintenance with no need to sand or remove the existing coats. What is mill glaze and do I need to remove it? Mill glaze gives a shiny finish on new timber and is caused by the combination of wood oils and resins as well as the planing blade during manufacture. Unfortunately the presence of mill glaze prevents almost any finish from penetrating the surface of the wood as it effectively closes the pores and by the time the pores open again naturally after several months the timber will have already been damaged by the effects of weathering and moisture. You must remove mill glaze before treating your wood in order for the finish to be able to penetrate the surface. To remove mill glaze use Owatrol’s Prepdeck in a 50:50 dilution and water and scrub it into the surface with a brush. Rinse it after 30 minutes and then apply a 25:75 mix of Net-Trol to clean and neutralise the surface leaving it ready to apply a finish. We would then recommend using Textrol or Deks Olje D1 saturating wood oils or Aquadecks or SCS for a water-based finish or you could use a finish of your choice. How can I stop my deck from splitting and moving? When new timber is first exposed to the elements it expels its naturally occurring moisture very rapidly as well as absorbing and releasing moisture from its environment. This process is called ‘transfer of moisture’ and can leave some very damaging effects if not regulated. For this reason, we would always recommend using our unique solution Seasonite for new timber as it controls the transfer of moisture and prevents movement and splitting. My decking was treated last year but it is starting to peel – should I sand it back? Yes you could sand the deck back but you would need to remove all traces of the coating which is very laborious and if you wanted to apply a penetrative finish you would need to clean all of the dust from the pores of the wood. A simpler solution would be to Prepdeck stripper followed by Net-Trol to strip the wood and clean the pores ready for applying a finish as this will give a better result in much less time! Should I buy pre-stained deck boards? There does seem to be a growing trend towards buying pre-stained deck boards and it can save time but you need to be careful because they are generally stained with film-forming products which are not ideally suited to decking as they can peel and flake. If you can ensure that your deck boards are pre-stained with a penetrative product which protects the wood from within and does not form a film then pre-staining will certainly save time and ensure an even finish. Owatrol can offer industrial coatings and have arrangements in place for the spraying of these as well – be sure to ask what product your deck will be pre-sprayed with before agreeing as you don’t want to have to remove it and start again if it peels or flakes after a year or so! There are a huge number of products available now for treating wood surfaces and it is understandably sometimes difficult to figure out which is best for you. One thing we would always recommend though is to get the best quality product you can right from the beginning. It may cost more in the short term but in the medium and long term it will save you both time and money and preserve your wood for years to come. You can read our original list of questions here on The Decking Network.